There is no indication of any attitude control systems, nothing even physically representative like a few nozzles or vents. Does it just spin wildly through it's orbit or can they 'point and hold' it? Home page picture of the 'search region' is sweet. After four years what do we have? Nothing? I should have read further. Thing about that for a few minutes. Telescope design The optical telescope design is based on the MOST (Microvariability and Oscillations of STars) space telescope . The telescope is a 15cm diameter Maksutov Cassegrain design with two identical E2V frame transfer CCDs sharing the focal plane. One CCD is used for science purposes, while the other CCD is used as a star tracker to maintain the high pointing stability required of NEOSSat. The choice of a MOST-derived telescope design was based on a desire to a) minimize expenses while b) reducing mission risks by using a flight proven telescope design. The design of the telescope differs from MOST’s in that it includes an internal shutter (for sun protection) and field-flattening lenses to improve image quality across the focal plane. CCDs In another attempt to minimize costs a decision was made to use the flight-spare CCD’s from MOST. These flight spares had been used to test the design of MOST’s imaging electronics and to test the behavior of the CCDs under the expected on-orbit radiation environment. A technical assessment of the CCD’s was conducted and concluded that the CCDs were still acceptable for the science team’s needs. They didn't want to re invent the wheel, so there has been success with the telescope. Cargo wrote: I should have read further. It always makes me laugh when it's demonstrated that orbits can be maintained electromagnetically, but as far as the sun/planets/moons are concerned their overlapping electromagnetic fields have apparently no effect. It's all gravity. Cargo wrote: They practically admit it themselves. Even if we go along with the accepted model that the background is totally black, and the stars tiny pinpoints of white light, a dark adapted eye can see a star that is providing about 1700 photons/sec, so the NEOSsat is well capable of detecting the stars against the black background of space. With a very long exposure they would be looking for a dim moving object relative to the bright (overexposed) background stars, a faint smudge. There have been no 'fist light' images from the device, so I assume it is not seeing anything at all. I know I should not assume things though, perhaps the images are classified due to Canadian National Security concerns? That's likely what a Canadian bureaucrat might say I think. With measuring stellar oscillations yes, but there are no images from MOST. And it did discover information which overturned some long held beliefs and proves that there is a difference between Earth and space based observations, which must be an effect of Earths atmosphere. The MOST microsatellite has made a major astronomical discovery. The small space telescope has revealed that the star Procyon does not oscillate. This contradicts previous observations made from Earth-based telescopes. The discovery suggests that long-held theories on the formation and aging of the Sun and other stars need to be reconsidered. There are no images available from MOST though as it was not 'taking pictures'. Most likely Procyon is not a Sun at all, just as most of the points of light out there are not. GaryN wrote..With measuring stellar oscillations yes, but there are no images from MOST. And it did discover information which overturned some long held beliefs and proves that there is a difference between Earth and space based observations, which must be an effect of Earths atmosphere. Here is the specs on the orbit and telescope, and would like to pose the following logic.. It seems its limited to the visible range. If it made discoveries, seeing more beyond the atmosphere, can it also be said it supports to commonly accepted ideas of visible starlight in space? I have looked for other science packages but it seems only the telescope and ccd is all that was used. Have you found anything else? But I agree its sad they don't share the images. And I can't find much on the actual design specs. Seems all the images are behind a pay wall, but google search images peek.. The effective wavelength range of the instrument is limited in the red by the sensitivity of the detector and in the blue by the transmission properties of the glass used for the lenses. The filters were designed such that for a star of 10,000 K (average temperature for all BRITE target stars) both filters would generate the same amount of signal on the detector. The blue filter covers a wavelength range of 390-460 nm and the red filter 550-700 nm; both are assumed to have a maximum transmission of 95%. This was at portal site.. The question of what is visible in outer space can only be answered by astronauts in space. To say that because an instrument can see something does not mean humans can. The quantum efficiency of the eye vs the sensor is one thing, the other is the nature of the conscious perception of the events. It seems to me that it would not be surprising that astronauts will not be consciously aware of the photon flux from even the brighter supposed stars viewed from space, but if we can see them from Earth, then something is happening in the atmosphere to make them consciously identifiable. I question the use of precetible flashes compared to steady stream of starlight. Not that that paper wasn't useful information. Researchers at the Center for Robust Speech Systems (CRSS) in the Erik Jonsson School of Engineering and Computer Science (ECS) received a National Science Foundation grant in 2012 to develop speech-processing techniques to reconstruct and transform the massive archive of audio into Explore Apollo, a website that provides public access to the materials. The project, in collaboration with the University of Maryland, included audio from all of Apollo 11 and most of the Apollo 13, Apollo 1 and Gemini 8 missions. The transcripts presently available are just awful, very time consuming and frustrating to try and make any sense of. I'd bet there are some very interesting and enlightening comments in there that could raise a lot of questions about just what was visible and when. Will anything be redacted? While I have not read all the posts on this thread yet, it seems that there is some interest in the probability of manufactured light on planet Earth. This is something I have been following for a few years and see it as a strong possibility. How could this be verified or proved false. The Total Solar Eclipse seems like a good place to start. If the atmosphere is creating light, then the TSE is likely to be disturbing this action. At the time of TSE the Moon is illuminated by Earthshine about 58 times brighter the a full Moon on Earth. The shadow on part of the Earth could be expected to reduce the Moon's illumination and reflected light somewhat, but a pitch black Moon is very unlikely. The duration has a minimum of about 2 minutes and a max of about 8 mins. There must be a TSE which exactly matches the Sun and Moon sizes. This should produce a duration of possibly microseconds. A longer duration is only possible if the Earth's rotation has stopped and the Moon has stopped in it's orbit. Shadow Bands seen on the ground just before and after Totality are “an atmospheric disturbance.” (Scientific fact !) Is it possible that the entire TSE is “an atmospheric disturbance.” I think so. Baillie's Beads are always in the same place. The Sunlight peeping through nameless mountains and valleys should possibly move alignment from one Eclipse to another when viewed from widely varying latitudes. These beads appear to me to be continuous arcs created as the light is switched off at the start of Totality, and then switched back on at the finish of Totality. The location of the Black Disk within the corona does not change during Totality. This is not possible. The corona should move from one side to the other, unless the corona is also an atmospheric disturbance. My thoughts are that the Black Disk or Umbra we see is caused by the Moon's CORE blocking the Sun's field. The Penumbra is caused by the Sun's field being disturbed as it passes through the non core part of the Moon. This disturbance is at the point where atmospheric light creation would be at its most intense. The Eclipse starts exactly on time, according to light from the Sun. But this light has a lag of about 8 minutes. It is historical. The field from the Sun, which is blocked by the core of the Moon, must be instantaneous or in real time. Therefore the Black Disk in the atmosphere would be offset, to or near the edge of the Moon's position. None of the Moon would be visible during the entire Eclipse, which appears to be an optical illusion created in the electrified area of the ionosphere. If all this is correct, then there must be 2 light speeds. Our demonstrated and proven speed within the Solar System, and instantaneous field to field light transmission. I am constantly searching for photos of the Moon during a TSE, taken from space to see if the Moon turns black. Never found any yet. From the ISS would be great. They take photos of the shadow on the ground, not above them. Also the Lunar Reconnaissance Orbiter. It is in a perfect location to show the Lunar surface illumination at New Moon, both when there is, and also when there is not a TSE. During the 2017 TSE across the USA the LRO was turned around to take photos of the shadow on Earth. Some photos of the Lunar surface would have cost nothing. Surely the operators would think to do this. Perhaps you guys have seen something useful re the Moon during TSE, while searching for photos of the Sun. Needs to be in visible light. If the Sun creates a large arc or “sun” in the ionosphere, at the point of nearest contact with the Sun's field, it should be visible from the ISS. Don't know what I caught here. https://www.youtube.com/watch?v=B35fx3aw0ts Probably just lens flare, but it is interesting the way it changes shape and intensity when encountering large cliffs in the cloud. Hi paulandme432, welcome to the forums and thanks for taking an interest in this topic. Have not had time to digest your post yet, will do so soon, and also present my explanation of the mechanisms involved in producing this Earthshine, which is not really from visible Sunlight being reflected of Earth and illuminating the lunar surface. How could this be verified or proved false. The experiments required are simple, quick, and cheap, but NASA is obviously not going to perform them if it would destroy everything we have ever been told about the conditions in space outside of Earths atmosphere. Even though the Apollo astronauts have told us just how black it is out there and the low light photography experiments showed nothing at all, NASA has never addressed the subject, which is their only option. As for the Moon, there are a few things that are not right, the Lunar illusion for one, and the visibility of the Moon in a bright blue daylight sky. I don't believe the camera or film or processing were at fault. With the eclipse shadow on Earths atmosphere, is it visible Sunlight that is being blocked, or is it that the Moon is blocking the ionising radiation from the Sun and that Earths atmosphere is not glowing at visible wavelengths? Here is a fake image of the eclipse from the ISS along with the shadow in the atmosphere seen from the Mir space station. You will not find any astrophotography photos from Mir either, though my old Zenit film camera certainly could from Earth. And here is the latest eclipse photo from the ISS taken through an unknown filter, from the Cupola so looking through Earths atmosphere. They can not take a photo of the Sun at noon ISS time as 1) there are no outward looking portholes and 2) NASA will not take a neutral density filter up there and let an EVA astronaut use it on their Nikon D3 or D4 cameras for some portraits of the Sun from space. Well. I am told, we can see the Sun perfectly well from Earth, why would we want to put the astronauts at risk looking at it from space? Some images in the set show a flattened Sun, meaning it is being distorted by Earths lower atmosphere, meaning it is very close to the rim of the Earth. If the Moon appears so bright from Earth, why, on approach to the Moon, were the the first humans to see it not too impressed? The video cameras at the time required much more light than todays cameras, so the speckling of the lunar surface is most likely due to the low light levels and the camera having cranked up the gain to compensate. Love to see one of the new low light level, HD cameras perform the same approach. Thank you GaryN for the Eclipse photos. The recent one from the ISS may not be so recent. “In 1999, a French astronaut on the Mir space station snapped this photo of a total solar eclipse over Europe. The live stream from the ISS is very helpful because there is always some part of the machine included in the images, and the time is known. I would really like to see images from the Lunar Reconnaissance Orbiter, of the near side Lunar surface during a TSE, and at other New Moon times for comparison. To see if the Moon really does turn black during a TSE. Stars can, and also can not be seen from space, it seems. My conclusions are that stars can be seen from space, but not unaided. Magnification is required except for very bright stars. The planets should be visible unaided. The Sun should also be visible with UV filtering. Stars can be seen from the ground unaided for 2 reasons. The first is that the stars we see may be images created close by in the ionosphere. The second is that these images are further magnified by the huge curved lens of the atmosphere. What we see from space, with magnification, is starlight which is created where the rotating Solar System field interacts with other rotating fields to form another ionosphere. Both of these images would be created instantaneously. No light years. The outer starlight would take quite a while to get through the Solar System, travelling at our “universal constant” light speed. Is there any evidence to support this. Perhaps. Arthur Eddington was recognised for confirming Einstein's ideas on General Relativity, by “proving” the gravitational bending of starlight around the Sun. This was done during the 1919 Total Solar Eclipse. I suspect the few stars visible during a TSE are images created at the outer limits of the solar system. This may better explain their incorrect alignment. It would be fairly simple to check the validity of these ideas using Hubble simultaneously with Earth telescopes to track the same objects, preferably during an occultation. Would these images align. ? Do you know of any any Hubble timing anomalies or experiments to confirm accurate timing ?. Here is an example of more misinformation from the mainstream. The observers in this case are most likely not aware of the fact.Comet PanSTARRS, as viewed from Earth. Jets of material have been spewing from its nucleus, sometimes waving back and forth, as clouds of blue gas billow down the comet's strangely-formed tail. 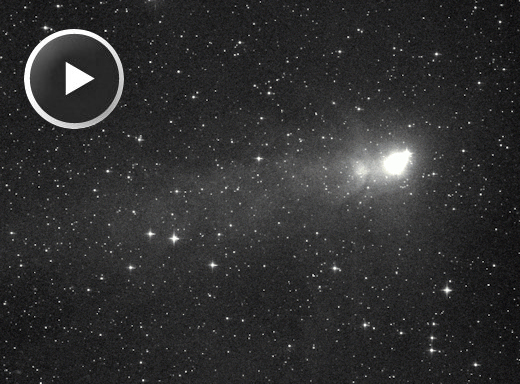 This comet is not visible, nor anything else, from outside of Earths atmosphere. Yes, Hubble will be able to see it, but Hubble is not an ordinary telescope by any means. The blue obseved from Earth is produced by what must be ionising radiation being emitted by the comet, which is causing CO in Earths atmosphere to emit the visible light they are seeing. It is the same thing with the Moon. The bright Moonlight we have on Earth is not from reflected visible sunlight, but from the ionising radiation produced in the lunar environment by bombardment by even shorter wavelength radiation from the Sun, the Lyman UV radiation from Earths excited ionospheric matter, EUV from the van Allen belts, or even by cosmic rays impacting the surface material, and generating the visible Moonlight we view from Earth. The Earthshine on the Moon is not from reflected sunlight off Earths, but by the ionising radiation produced in Earths upper atmosphere causing the lunar atmosphere, the nanometer sized silica particles in particular, which produce a full spectrum visible light when excited by the ionising radiation generated by Earths atmosphere. The direct ionising radiation from the Sun is responsible for producing the stronger light seen on the lunar surface, which takes the form of a beam with a bright central region and a more diffuse surrounding region. This bright central area was photographed from Lunar orbit both with colour and monochrome film. If the Chinese mission to the Lunar far side is successful, and if they make the information known, then I believe it will be found that the lunar far side is in general very dark, and that only when the central region of the Solar radiations lunar atmospheric dust produced beam passes over a location will there be any decent light available. It is 'Earthshine' that produces the general, low level light on the near side. The Atmospheric Light Transformer model explains much, experiments would verify it.